Walking down the streets of New Orleans is like no other experience imaginable. The culture, the people and, of course, the fare is vivacious and inimitable. As I passed down Tchoupitoulas and found my way to Poydras, I spotted a little white and red sign, barely hanging from a portico reading, “Mother’s Restaurant.” Looking at my watch, I realized it was nearly 1 o’clock in the afternoon, and there was an hour-long line wrapped around the old, brick building. The sign to Mother’s boasted some of the world’s best-baked ham, but I was craving a different dish, bread pudding. Finally, I was allowed into the establishment to wait in another line to order. I gazed at the walls that were filled with old black and white photos, vintage posters and tin signs. Once I reached the counter, I tried to sound like a local by ordering fast and efficiently, only to be in the way of a man trying to balance a keg on a dolly. Apologizing empathetically, I realized that my cover was blown, I was from out of town and everyone now knew it. Finding my way through the crowd, I discovered a table all the way in the back of the restaurant and planted my little self in the corner with the rest of my family. Moments later, the waitress comes flying to our table with our orders. I saw my dad point to a dish, asking the waitress if it was his side of ham, and she said it was the bread pudding. I checked to make sure she wasn’t laughing, and when I realized she was telling me the truth, I looked up at the sad brown and white heap of bread pudding and set it next to my red beans and rice. I said a little prayer and encouraged my plates by saying that the most humble dishes are the best dishes. Amen. I fell in love with my red beans and rice at first bite. And with every spoonful, I eyed the bead pudding, seeing if it would get prettier. It never did. After the last bite of French bread and beans, I put the bread pudding in front of me. I took my fork and slowly edged off a piece of the pudding, only to find a pool of what looked like sugar, butter and cinnamon. I drew the fork to my mouth, and all of the flavors I assumed were in the pool were now doing summersaults in my trap! I looked around to make sure that no one could see my excitement, for fear that they would ask for a bite. I snuck the white plate filled with heaven under the table, and every so often, when no one was looking, took a bite! Now, to make it clear, I am not a very selfish person. I am a giver by nature, but if anyone took a piece before I had my feel, I think they might have lost a finger! Eventually, I allowed the rest of the party to split a ration big enough for a mouse. I thought it was quite generous. As I left, I was happy, content, and dreamily making my way through Mother’s Restaurant. My dreams were slightly interrupted by a keg on a dolly nipping at my heels. As I reached the sunny, warm New Orleans streets, I felt empowered, sustained and full. All because of my contraband bread pudding. Place the breadcrumbs in a large bowl. In a saucepan, combine milk, cream and butter and simmer until all of the butter melts. Pour milk mixture onto the bread and stir to combine. In a separate container, whisk eggs, sugar, vanilla, cinnamon, nutmeg and fruit cocktail together. Pour into the same mixture as the bread and milk. Make sure all of the ingredients are combined well and there are no dry pieces of bread. Pour into a 9×13-inch dish. Bake in a 350o oven for 1-1 ½ hours until golden brown and set in the middle. Pour the bread pudding sauce either on each plate when serving or pour onto the bread pudding when it has finished being baked. In a small saucepan, combine all of the ingredients and heat on medium-low until slightly simmering. Reserve until ready to serve with bread pudding. Oh my gosh. I was just in NOLA for the first time at New Year’s. I missed Mother’s, but now I can’t wait to go back! It’s definitely a place that should be on your list! It’s terrific! 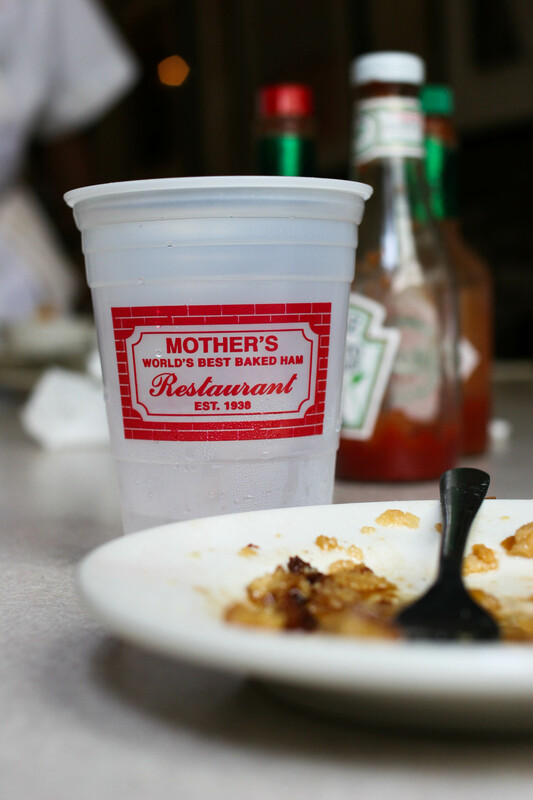 I LOVE Mother’s — I discovered it on a work trip to Nola awhile back where I stayed at the Lowe’s Hotel that is basically 2.5 blocks away. That was both amazing and detrimental to my waist line. It is absolutely one of my favorite places in Nola — both for the food and the staff. LOVE! It’s such a gem! So glad you love their vittles too! 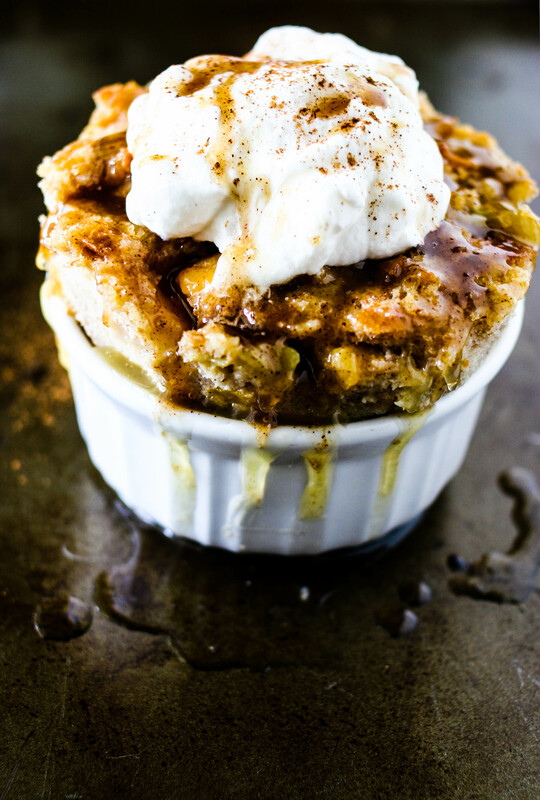 I dream about their bread pudding… And yes, luckily I don’t live in New Orleans or else I would weigh twice my size! I want to go to MOTHERS’!!!!!!!!!!! My mouth is watering so much I can’ t talk!!!! We need to take a trip together and go! My o my o my! This is serious stuff. It don’t get no more serious! Yum yum yum!! I remember we told everyone around the table it was bad so we could keep it to ourselves 🙂 hehe! Oh we did! We should feel so guilty, but, alas, I do not! Oh! I remember the tiny bite I got from the bread pudding! It was the most exciting bite! It was delicious!! It did look sad but it had a delicious flavor! Very pleasantly surprised! 🙂 C’est beaucoup bon!! What it lacked in beauty it won in flavor, and really, that’s what it’s all about!